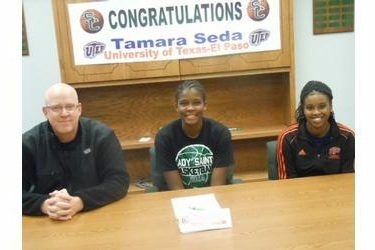 Seward’s 6’4" center Tamara Seda signed with UTEP Thursday afternoon in the All American Room at SCCC/ATS. Seda has played three games for Seward after redshirting last year. She chose UTEP over Oklahoma State, South Florida, and Florida State. She will join former Lady Saint Anete Kirsteine in the UTEP program.